Every year we want our students to experience what it means to serve others. Throughout our lives we all have the opportunity to help someone else & it blesses our lives more than we ever expected. To teach them the simple life lesson of unselfishly giving and serving someone else is important to our mission of teaching our students to be more like Christ. This year we spent the day serving at Grace House in Fairfield. Grace House provides stable Christian homes for girls who have been abused, neglected or abandoned. They own and maintain 8 properties where they are able to house, feed, educate & offer healing to their residents. Every 2nd Saturday of the month they invite volunteers to come help work on their properties. We grabbed our gloves, rakes, weed eaters & mowers (and lots of hydration... it was HOT!) and set out on a landscaping mission! 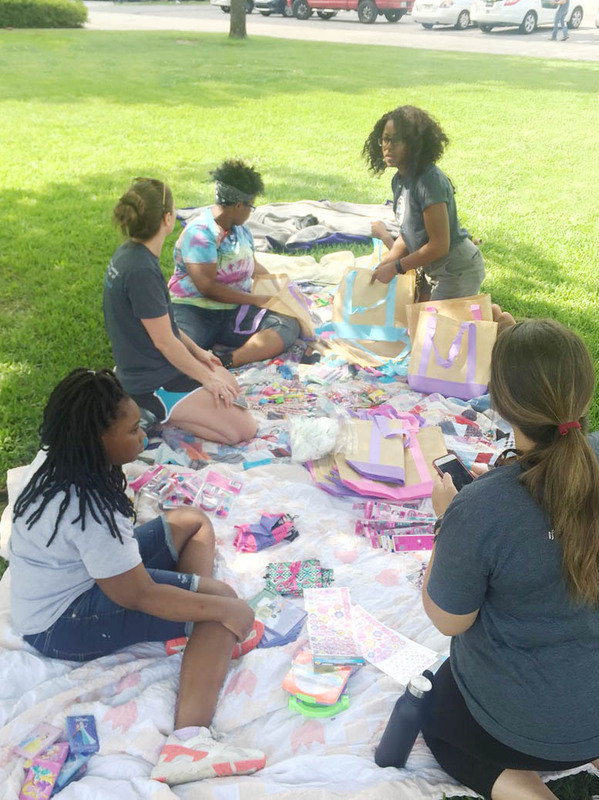 The girls started off by making gift bags for the residents full of fun girly items & a handwritten note of encouragement. The boys headed to the house & got to work! Here's a few photos before we got started. There was grass to be mowed, hedges to be trimmed, trash to be picked up & trees taller than all of us to be removed. After several hours and not one complaint we stood back and admired our handiwork! Andrew Dees, Alexis Jackson, Kashondra Smith, and Javeen Thomas, all members of the UAB School of Health Professions’ Master of Science in Health Administration (MSHA Class 51 and Class 52) program, partnered with UAB Medicine to host Open Eyes Birmingham and discuss health administration careers with students from Birmingham City Schools. Open Eyes Birmingham is a non-profit group whose mission is to help at-risk youth across the Magic City discover “independence through education.” On this day, their students toured the UAB Health System and discussed healthcare organizations as well as servant leadership with the MSHA and UAB Medicine students. The students also heard personal accounts from Stephanie Woods, associate chief nursing officer, UAB Hospital, and alumna of the Department of Health Services Administration’s Healthcare Quality and Safety programs, as well as Nigel Brown, executive director, Performance Excellence, UAB Hospital, and a Healthcare Quality and Safety programs, advisory board member. Every month the outing happens and it feels like a blur. Trying to make sure everything goes as planned, everyone is participating, having fun, engaged, the lesson being implemented etc. I get home and it's like what just happened? Were we successful in all we attempted today? One of my favorite things is looking back at the pictures. It slows everything down into all the little moments that happened. Every lesson that was taught, every vote of confidence given, every encouraging word spoken. I know I wear this line out, but it only takes one- one moment, one sentence. I can name you 3 of these in my own life that changed, propelled, and still drive me today. I firmly believe that is happening at every outing. Today we most likely inspired a chef, taught a boy had to be a father at his table, taught a girl what she deserves and should expect in a date, removed barriers from functioning at any level of society, turned a possible domestic violence case into a man of respect. These are the things that matter. This is what leads to change. To God be all the glory. Our great friend Dr. Robert Record of Christ Health Center (www.christhealthcenter.org) and the wonderful people at St. Vincent's Hospital (www.stvhs.com) welcomed us for our month of Medicine! We started with learning about the founders of the hospital, how their faith guides the hospital's services, and why it was needed... A group of Catholic nuns saw the need to treat the growing population working in Birmingham's booming industries. Jan Gannon, VP of Patient Care Services, served as our guide and we can not thank her enough for the outstanding day she planned for us! Our first stop was the ER where a doctor and nurse shared their personal stories of being the first in their families to attend college and their individual paths traveled. The kids absorbed some great wisdom about being life-long learners and how no dream is beyond their grasp. From the ER, we made our way to the hospital's "control center" where patient rooms are monitored and scheduled. The kids learned there is so much more than doctors and nurses that make up a hospital and how technology plays a critical role in its management. Next stop- the OR where we saw firsthand an operating room and heard about all the roles involved in surgery and how they work seamlessly together as a team. We learned about preventing infection with our cool personal protective equipment and hand washing. We made our way to a Board Room for lunch where several nurses shared their stories. Chuck, Director of Nursing Administration, talked about growing up in West End without a father and earning both academic and music scholarships to Montevallo where he earned his music degree but later went back to Samford for nursing. He discussed how if the kids worked hard in school they could do the same and earn scholarships to pay for college. He also talked about making their career their passion and loving what you do. Terri who also is an RN talked about how she went from patient care to managing patient control and the multiple career paths via nursing. She also emphasized being a life-long learner as she is half way through her career and still adding to her education. None of our kids had an interest in medicine before we started the day, but by the end... half of them raised their hands saying they would consider it as a career! Our goal is to provide incentive with real life examples of competition and how working hard at achievable goals generates rewards. It also gives us a chance to track their progress, assist where they may need help, and encourage when they succeed. 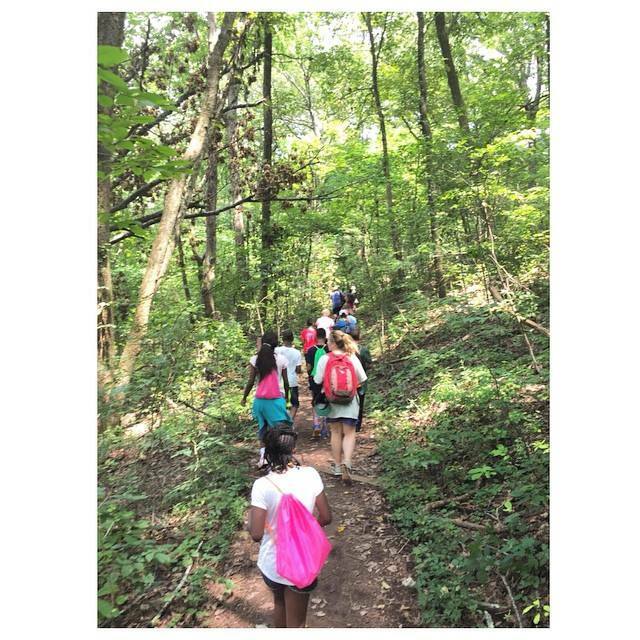 In August we headed to Ruffner Mountain Nature Preserve (www.ruffnermountain.org) for some outdoor fun and education! This 1,000 acre urban nature preserve is only minutes from most of our kids houses but most have never had the chance to explore. We started inside with our guide Mr. Carl- a local volunteer professor who explained Alabama's rich geological history and what we would be seeing on our hike to a limestone quarry. The kids learned the different types of rock, fossils, and native minerals and how they shaped the history and progress of Birmingham through the steel and coal industries. We grabbed a quick lunch to fuel up for our 4 mile hike while each mentor shared their personal careers and how nature/geology/science was involved. From construction, computers, photography, engineering, insurance, exercise, and more- each involved aspects of geology, physics, biology, chemistry. With plenty of bug spray and sunscreen, we hit the trail to the quarry! Mr. Carl pointed out the geology he had introduced and quizzed us by picking up samples along the way. Being in the woods and away from the chaos of the city also allowed for some good one on one time to catch up on life between kids and mentors. We finally reached the top!! The kids were hot and worn out, but they made the trek to enjoy a great view of our city. In the bottom of the quarry, the kids got to see a fossil of a prehistoric plant and talk about how the limestone from the quarry when active provided stone for much of Alabama's highways. We ended the day discussing how BIG God is and how AWESOME His creation is YET he cares about the smallest details of our lives and wants to know each of us so intimately. So much so that he gave his own Son as a sacrifice on our behalf. Tired legs and feet didn't hinder any smiles. It was a great day getting away from the city and into nature! July will be our annual month of service. This first service project focused on the men and women who protect our freedom and serve us day in and day out. We visited the Alabama Veteran's Memorial (www.alabamaveterans.org) where we picked up trash along trails, cleaned up the memorial, and planted flowers to spruce things up some. We kicked off the day with a surprise visit from the American Legion riders and their bikes! The kids got to meet these veterans and hear some of their personal stories. Next we hit the trail to the Memorial to remove dead shrubs, spread mulch, sweep out the Hall of Honor, clean the brick paver memorial, and plant flowers. Needless to say it was HOT! The kids worked hard alongside veterans and active military. We took a break inside to cool off for lunch and hear from two wonderful lady veterans about their service and opportunities for college and careers via the military. Next we headed back out to the Hall of Honor to hear from Sgt. David Lee about how the military will pay for your college education and even more career paths that are available. (Also learned that Nike makes combat boots...) He shared his personal story of his mom coming to the U.S. and he being the first to attend college. The kids were full of questions from "What is the largest gun you've shot" to "Aren't your fatigues hot out here?" Two young high school recruits shared why they joined the military and what it means to serve. One of their grandfather's names was on the Hall of Honor after paying the ultimate sacrifice. We discussed living a life of serving and how Jesus came to earth as one who serves. We broke up into groups and prayed for the families who have lost loved ones and for those who are currently fighting to defend our country. It was an incredible day and I think the kids genuinely learned what it means to serve others and that there are careers that allow you to serve others every day. Our June outing focused on mechanical skills, opportunities to work with your hands, and redeeming a "broken" situation. To demonstrate this at a relatable level, we visited our friends at Redemptive Cycles for a starter course in bike repair. The kids literally learned the "nuts and bolts" of mechanics, different types of tools and how to use them, designing and crafting things instead of buying them, the engineering behind the bicycle, a brief welding demo, examples of metal art, and how Redemptive serves the community through their earn a bike program. From Redemptive, we headed to Railroad Park for lunch and our Bike Build Challenge. The kids took the skills they learned and divided into 3 teams. Each team was given a broken or disassembled bike in need of repair. In timed trials, they repaired the bike and rode it in relay fashion to the finish line. With the broken bikes as our example, we discussed how something seemingly broken and useless could gain new life through a redeeming process. If we had left the bikes as-is at the park, they would rust and decay or be scrapped. In the same way we gave bikes another chance, Christ offers redemption from our broken situation for a life filled with purpose. July will be our annual month of service. We'll visit the Alabama Veterans Memorial to pick up trash around the park, serve veterans, hear their stories, and learn about opportunities to serve in the military. Our inaugural outing was a huge success! This short semester (May-June) has 13 students and 9 mentors. Our day began at Railroad Park introducing the program, outlining the semester, and our one rule...RESPECT. Respect for God, others, & surroundings. We then paired off with mentors to set goals for this semester. We really desire to see tangible change in these kids and by setting goals we're able to track progress and encourage these dreams through to fruition. From the park, we took a short walk to McWane Science Center (http://www.mcwane.org/) and explored tons of concepts in a fun and engaging atmosphere including- physics, chemistry, biology, meteorology, archaeology, mathematics, and logic. We took a break from the action for lunch and to hear from John Blevins, a civil engineer with 25 years experience in wastewater treatment plant design and construction. John explained how many of the concepts the students were experiencing at McWane were used in the work he had done and education required for his career. More importantly, John shared his life story and the work he is now doing through his nonprofit Sweetwater Outreach (http://sweetwateroutreach.org/). John lost both his parents in high school and was faced with the same challenge many of our students face- an absent parent. John shared how he had a decision to make- he could blame his situation and drown in self pity or he could rely on God and make the most of what he had. He noted a teacher in high school who told him he wasn't "college material", however John went on to graduate with a civil engineering degree, a 25 year decorated career, and a beautiful family of his own. He recently retired from that career to pursue clean water options in Africa. He shared the challenges facing people in these third world countries and the simple things like clean water we take for granted. The kids were glued to his story and soaked up every bit of it. It was an incredible day! For June, we'll introduce basic mechanics with our friends Redemptive Cycles and the wide array of career opportunities working with your hands. Our Bike Build Challenge will show how something broken is turned into a purposeful creation. One last bit of exciting news...the IRS has accepted our 501c3 application and now able to accept donations up to $50,000! We are so very thankful for the incredible amount of support we've already received. These funds allow us to take trips like the one above, provide tuition and fees for camps and tutoring, and hopefully later a college scholarship fund! We're not about the numbers. We're all about the number. We're about the number of kids who make life altering decisions or changes in behavior that allow them to live life to the fullest and give back to society. We won't be an organization looking to grow exponentially in record time. Those stats are great for feeding the poor, caring for the sick, or housing the homeless. If it's just 1, we're all about that number. 1 kid can influence a circle of friends, change their home, change their heritage, cure cancer, become president, become an evangelist that reaches thousands. If our success is only 1 kid, that's our number. After handing off the neighborhood outreaches in December, we’ve felt led to remain in the Woodlawn community but in a more focused manner. There is much to be done and plenty of ways to minister, but we decided in order to be truly effective we have to narrow and refine our intentions, both with who we minister to and how. Our hearts are drawn to the kids. There’s both an innocence they possess and an eagerness that’s hungry for something more and different. So, we started to brainstorm...What is the single most important thing we can do for these kids? Obviously, Jesus is the biggest change they can experience. And secondly, being educated. WHEN A CHILD RECEIVES AN EDUCATION, THEY GAIN THEIR INDEPENDENCE. No matter what life deals them, an educated child is prepared to find their own way. We plan on doing this by building relationships that allow us to share Christ and expose kids to new experiences that promote INTEREST & MOTIVATION towards their education. If you can’t see what’s waiting, how can you chase it? Most of these kids think it’s either McDonalds or the NBA. There is so much success to be had between earning the minimum wage and being a professional athlete. Our goal is to expose youth to a world otherwise unseen with field trips to places of education, industry, art, culture, nature and more all with the goal of igniting a dream and revealing a God-given purpose. I can remember when I was younger, my parents knew I had expressed interest in building and design. They exposed me to individuals in those professions and I can still remember the details of those experiences and how they motivated me to pursue where I am now. It only takes one moment. An example of this is when we took a young girl to meet some local attorneys and prominent judge. She had expressed interest in law, particularly animal rights. I will never forget the look on her face talking with a fellow female attorney and then walking into the county courtroom of Judge Brown. She may not even become an attorney, but I believe that day could be the one thing that propels her to excel in school in pursuit of any of her dreams. I’m still not sure who made the bigger impact- the attorneys and judge...or her. So, with that, Sarah & I would like to announce the launch of Open Eyes! Huge thank you to @battlerepublic for hosting our outing today! We loved hearing the coaches’ stories about choosing careers and running a gym! They talked a lot about hard work, perseverance, being unique, choosing your path, and daring to be different! The kids and mentors also got a great work out in! FIGHT ON! An amazing day learning about all things science at McWane Science Center!! It’s amazing how much science impacts our every day lives!! So fun to learn from Dr. Courtney Petty about all the different fields and careers related to science! SCIENCE! We are so excited for our outing on Saturday! In January, we asked our kids topics/careers they are interested in. We had several science related fields and it just so happens that McWane Science Center has the perfect exhibits and IMAX movie right now! We are looking forward to studying the ocean and the human body! Our speaker this month will be Dr. Courtney Petty! Dr. Petty has her doctorate from UAB and currently is a professor at a local college! We are thrilled to hear her story and about her journey to a career in science! Another great @openeyesbham outing! Such a fun day with @eddieharringtonrealtysouth learning about what it means to be a Real Estate Agent! Thank you also to @realtortbell007 for sharing with us today the importance of first impressions and doing everything with excellence! Check out our stories for more pictures from our outing! We are excited for February’s outing this Saturday! @eddieharringtonrealtysouth will be hosting our outing and speaking to us about careers in Real Estate! We are so thankful for local businesses and professionals who partner with us to share new career opportunities with our students! Amazing mentor retreat planning for Spring 2019! We could not be more thankful for these mentors and the way they give so selflessly! We had a great outing today learning about local non-profits and ministries! We also discussed career and volunteer opportunities in the non-profit field. With it being close to Christmas, we wanted to take the time to give back to another local group by making gift bags for the students at Rising Hope Academy! And to add in some extra fun, we ended the day watching “The Star” and talking about the true meaning and purpose of the season! In the middle of a busy holiday season, #GivingTuesday is a great way to pause and give to organizations that do important work all year long. At Open Eyes we commit to making your donations count! We use all funding to impact the lives of students by organizing meaningful outings each month to explore educational and career opportunities. We are incredibly thankful for every one who supports us through prayer and giving! We are amazed at the work the Lord has done and continues to do! Every dollar donated to Open Eyes goes directly towards outings, extracurricular needs, and scholarships for our students giving them a passion for life & for Jesus. Their futures are bright because of your support! It’s still a few days away, but Giving Tuesday 2018 is almost here! Your donations make what we do at Open Eyes possible! We carefully use funds to directly impact the lives of our students! YOUR GIFT CAN MAKE A HUGE IMPACT! Visit our website for giving options (you can make a one time gift or set up recurring monthly donations). Link in profile! We are so thankful for local businesses that open their doors and share their stories with our students. Today we visited @bigspooncreamery and learned about being entrepreneurs! Our students heard about the long hours, dedication, hard work, determination, and character it takes to follow your dreams and open a business! Plus, get got to eat some of their amazing handcrafted ice cream! Check out our stories for more highlights from today’s outing! Open Eyes has invaded @hotdiggity_dogs . Such a cool and friendly spot. Thanks for having us. Check it out! One of the greatest decisions our students can make is choosing to give their life to Christ! Congratulations Ariyanna on your baptism! We are so proud of you! We’ve had an awesome Spring semester! We’re celebrating with some fun for this month’s outing. Bowling & pizza here we come!